In the introduction to the 30th anniversary issue of The Women’s Review of Books, editor Amy Hoffman makes that point that — yes — this many years later we still need a forum for thoughtful, intellectual, political and passionate conversation about the meaning of gender in the printed, published, word. Disgracefully, even after forty years of the contemporary women’s movement, feminist scholarship and critical analysis, and women’s creative writing, receive little more attention in the mainstream media in 2013 than they did in 1983. Unlike in 1983, when WRB and our sister publications could cover just about every feminist work that appeared, these days university, small, and even trade publishers are releasing an outpouring of interesting, challenging, original books by women. Yet most of this is ignored by daily newspapers, glossy magazines, and book review publications like the New York Review of Books. When it’s not ignored, it’s often treated fleetingly or dismissively: and the well-deserved prizes and recognition [of] writers like Joan Didion (an NYRB regular), Adrienne Rich (lauded more enthusiastically after her death last year than she often was in life), or Louise Erdrich (winner of this year’s National Book Award) do not mitigate the situation. 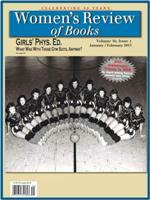 I feel lucky to be a contributor to this anniversary issue with a piece, Gym Class Blues, which considers the new book, Active Bodies: A History of Women’s Physical Education in Twentieth-Century America (Oxford 2012) by Bucknell history professor Martha H. Verbrugge. Feminist scholarship may not be the hot topic of the moment – either in universities or cocktail conversation — but there is no escaping its importance and, yes, relevance. How else do we come to make sense of the past and present?